Taylor Swift said on Instagram she’s releasing a single on Thursday night. It will be the first in her forthcoming album “Reputation,” due November 10. Earlier, Swift posted a cryptic video of an angry snake on her social media accounts. It hints that she wants to subvert the derogatory “snake” label associated with her. She’s probably going to release a diss track, and has plenty of celebrity enemies to choose from. The song will set the tone for the new image she’s cultivating for herself. Taylor Swift is officially dropping new music this week on Thursday. After posting a series of cryptic videos on social media that show different parts of an angry snake, Swift or someone on her team uploaded a picture on Wednesday of an all black background with a text overlay that says: “First single out tomorrow night.” It will be the first from her forthcoming album “Reputation,” to be released November 10. Fans suspected this was coming after watching Swift delete everything on her social media in anticipation for the announcement. The snake videos were a major clue too, and likely tie into the new song she reportedly plans to release on Friday. Why a snake? Swift could be about to release a diss track, and will subvert the derogatory “snake” label she’s been given. On Wednesday, Swift posted her final video, revealing the snake’s head. It’s not happy. One Twitter user joined all of the videos’ images together to show that they form one big, wriggly reptile. Swift has been involved in numerous celebrity feuds and rivalries. In the past year or so, her opponents have labelled her as a “snake” — a legless, bottom feeder that attacks people bigger than her — to insult her. The association started shortly after Swift broke up with Calvin Harris in June 2016. The news leaked that Swift wrote his biggest hit, “This Is What You Came For” — also a Rihanna collaboration — under the pseudonym Nils Sjöberg. Harris ranted about it on Twitter, and the people supporting him spammed Swift’s Instagram comments with the snake emoji: ???? . It was so drastic that Instagram implemented special anti-harassment measures to delete them. The snake label didn’t go away. Soon afterwards, Kim Kardashian West, another one of Swift’s rivals, subtweeted her with the emoji. It stuck. Wait it’s legit National Snake Day?!?! ?They have holidays for everybody, I mean everything these days! ???????????????????????????????????????????????????????????????????????????????????????????????????????????????????????????????????????????????????? Wiping her social media pages of everything was Swift’s way of cleaning the slate, clearing off her space where she could be shielded from comments. And just posting snake videos is a way of reclaiming the image. Because the image of the snake is, for Swift, inextricably bound with her celebrity rivalries, there’s a pretty good chance these videos are teasing a diss track. Who will she take aim at? Well, she has a long list of enemies. It could be Kardashian West. It could be Harris. There’s also Kendall Jenner, Katy Perry, Camilla Bell, Demi Lovato, Ashley Greene, and probably some others I can’t remember. Swift’s strategy for her rivalries has generally been to appear as being above the fray. When Katy Perry released her diss track “Swish Swish” about Swift earlier this year, and then went on an interview tour with a peace offering, Swift totally ignored her. But of course, silence is a strategy of its own. By ignoring Perry, Swift made it seem like she wasn’t worth her time. For Perry, it was embarrassing. According to Us Weekly, Swift’s new song is meant to revamp her image with a different kind of sound. She successfully went from multiplatinum country-pop singer to bona-fide pop star with her 2014 album “1989,” and her newest one, if the clues are anything to go by, may be an even more dramatic change. When it happens, it will be on the weekend of the MTV Video Music Awards, a time of maximum celebrity drama. 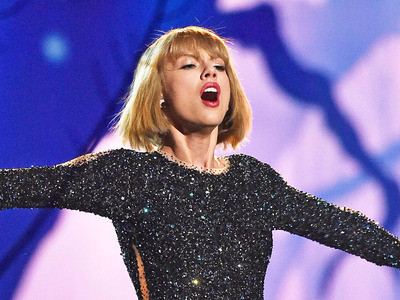 What kind of new Taylor Swift will we see?